Alcoholic drinks have been forbidden on Belmont University's campus since at least 1951. The small Christian school in Nashville has decided to make an exception to the rule when it hosts a presidential debate Tuesday. A private school with a self-described "strong commitment to providing a Christian community of learning and service," Belmont is allowing alcohol to be served at a hospitality tent for the news media, one of several substantial changes the college made to land the big event. Universities that vied to host the debates had to be willing to pay $1.35 million to cover production expenses, then millions more to erect facilities, spruce up campus grounds and shuffle sports events. Some also canceled or rescheduled classes to enhance security and debate setup. The payback: instant international attention. The debates also help with a university's mission by offering opportunities for students and the community to learn more about politics and election issues. School leaders say the sacrifices and concessions are worth it. "It's going to generate huge numbers of conversations among students and faculty," said John Geer, a Vanderbilt University political science professor who's written extensively on presidential elections. Republican John McCain and Democrat Barack Obama agreed to three debates, the first at the University of Mississippi last week, then at Belmont on Tuesday and Hofstra University in Hempstead, N.Y., on Oct. 15. 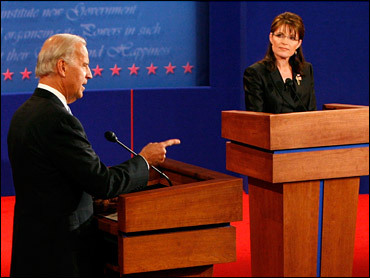 Vice presidential contenders Sarah Palin and Joe Biden met Thursday night at Washington University in St. Louis. At Hofstra, a school of 12,600 students, the David S. Mack Sports and Exhibition Complex was being transformed into a debate hall, with the scoreboard removed and air conditioning ducts installed above the candidates. The athletics department had to move temporarily so the school could set up a media facility for 750 journalists. Some teams arranged their game schedules to be away during the debate; classes for students have been canceled for the day. The school, which installed more telephone and computer lines and touched up sidewalks and other items, puts the debate preparation price tag at around $3 million. Like the other university hosts, Hofstra has held lectures, conferences and academic courses focused on the issues, history and politics of presidential elections. "I'd do it again, if we can," Hofstra President Stuart Rabinowitz said. "There is some dislocation, but the reason it's worth it to me is there's such an excitement and interest from our students on campus. I actually think there is an obligation for universities to try to inspire their students to be active participants in the democratic process." Belmont President Bob Fisher said the university built its Curb Event Center a few years ago with a presidential debate in mind. Besides allowing alcohol, Belmont moved fall break for its 4,800 students to coincide with debate week. It's also spending about $3 million, a sizable chunk of that on a temporary facility built on the school's soccer field for news media covering the debate. The school's soccer teams have to play most of their games this fall at a facility off campus. At Ole Miss, debate costs were estimated at $4 million. That included extensive work to construct the media facility, one of its most expensive projects. "We're interested in being able to show the world that the University of Mississippi is a world-class university, that we're not just this regional university," said Andy Mullins, executive assistant to Ole Miss Chancellor Robert C. Khayat. Officials at Washington University, which has hosted several presidential debates, said the school already had facilities and support measures in place. Officials there declined to say how much the private school spent to host the debate. The private Commission on Presidential Debates picked its four debate sites from 16 contenders. Louisiana leaders were upset when New Orleans was passed over and criticized the commission for saying the region hadn't sufficiently recovered from Hurricane Katrina.